The hotel name The Standard may not be well known on this side of the pond but over in the US, you always get a respectful, in-the-know nod when you tell people that it’s your temporary home. When I was planning my trip to New York, I knew that I wanted to stay in the Meatpacking district and The Standard is the hottest hotel in New York’s hippest neighbourhood. What a way to be introduced to New York on my first visit! I don’t think the Meatpacking district is really comparable to anywhere in London. It’s a fusion of the undeniable cool of Dalston and Shoreditch mixed with luxe, high end Mayfair and Bond Street. The Standard communicates the essence of district better than anywhere else. The location is top notch, a stone’s throw from Pastis which is my favourite spot for brunch. Magnolia’s Bakery and Bleeker Street are a short walk and High Line runs right under the hotel. What more could you want? The exterior of the hotel is quite unexpected, it looks like a slim ex-council block rising up by the Hudson river. Gritty and industrial on the exterior but sleek and polished on the interior. Chino and shirt-clad hipsters await new arrivals and usher you straight inside with a friendly yet efficient nature. The lobby is sleek and bright with oversize furniture, making for a chic introduction to the hotel. There is no other way to describe my room than amazing. I love light and the huge floor to ceiling window lets in SO much light. My room overlooked the High Line park, Diane Von Furstenberg’s actual office was across the street and I could see the Empire State Building in the distance – best view ever! The room has a lovely, open feel due to the huge windows – there’s also a floor to ceiling window between the bathroom and bedroom which is lovely from a design standpoint – not great if you’re holidaying with a friend but a discreet curtain can be put up in minutes. The shower itself is awesome and has a huge rainfall shower head. The one thing that wasn’t overly practical is there wasn’t a door to the shower so the floor always got soaked and it got a bit nippy. The “wardrobe” area was a bit of a disappointment. As it was a tiny rail behind the door, most of my clothes ended up triple hung or in my suitcase. I’m pleased to report there is plenty of shoe room though – I lined mine up along the window so they got to see New York too. Minor design flaws in the room amenities aside, the hotel is fantastic. 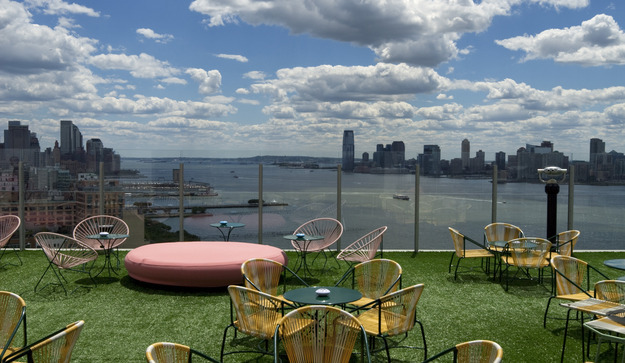 The rooftop bar, Le Bain, is a chic oasis of calm in the daytime and one of the city’s hottest bars by night. Skip down the industrial, graffiti-covered concrete stairwell to a lively bar with booming music and a jacuzzi. If you’re heading to New York, stay at The Standard. I know I will be next time, which needs to be sooner rather than later! My only niggle was the storage space but everything else more than makes up for it, everything else was perfect especially the incredible views and wonderful staff.